The Public Housing Defence Network is calling for the Opposition parties to support the Greens motion in Parliament on Wednesday 6 June 2018 to block the Andrews Governments Public Housing Renewal Programme (PHRP). The PHRP reduces Public Housing, displaces tenants, sells off public land to private developers and reduces open space and amenity, and will drive up homelessness. If you would like to stop the Andrews Government PHRP, please contact the Opposition MPs from Monday 28 May, by email, phone, or text. (See suggested letter and addresses inside.) Every action counts! 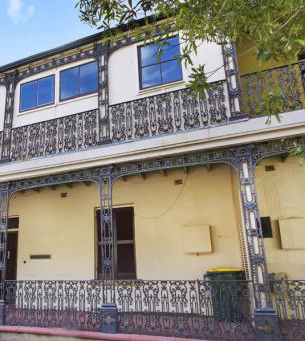 As you may be aware the 2nd of our homes (29 Lower Fort Street Millers Point) is to be auctioned off by Di Jones Real Estate Agents. Like the invitational viewings the auction will be held in secret behind closed doors! Update, 29 August: YouTube video of protest added. Public housing’s operating model is unsustainable. Costs are outstripping rental income and the division is forecast to be in deficit in 2012–13. Full report here.